THE least explored aspect of gardening, probably, is the cultivation of shrubs. The reason is that mostly when shrubs are included and planted in gardens, they remain unkempt and are allowed to grow unwieldy. The usual picture is the appearance of a few blooms at the end of long slender branches. Such shrubs, normally, become the launching pad for insects en route the indoors. But shrubs have other aspects too. Shrubs are the most beautiful garden plants, if they are planted judiciously. These can be so planned so as to keep the garden colourful throughout the year. Shrubs become very handy when there is a gap between the flowering of winter, summer or rainy season annuals. These are valued for their blooms of varied colours and sizes. Some shrubs are known for their delightful, fragrant blooms and peculiar shape. Call it a bonus or extra advantage, some shrubs look distinguishing because of their ornamental foliage. Shrubs are the least demanding plants in a garden. Except for a yearly pruning to contain excess growth, and in some cases a dose of fertiliser, they grow on their own. Insect pests and diseases afflicting them are few and manageable. No doubt, they form a good clump where there is no dearth of space. In small gardens, even a single shrub specimen has the capacity to show its personality. While planning the planting, keep room for the shrubs behind the beds and see that the shrub roots and the bed or lawn area do not compete for forage in the common land. Naturally, the shrub will prevail. You may have been growing bougainvillaea, hibiscus, chandni or kaner for years now. These are easily available too, in many colours and variegation of leaves. For a difference, try some different shrubs. Cassia biflora is a well-known yellow-flowered shrub and is frequently grown by gardeners. How about trying the cassia alata? See the accompanying picture. 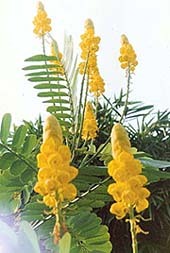 It forms a fine shrub with large leaves and cone-shaped flowers (spikes) that are deep yellow. They grow erect pointing upwards. A large number of spikes appearing at the same time present an amazing sight. Grow it and you will have many curious visitors. Do not worry, there is nothing exotic about it and this hardy shrub grows very well here. Calliandra is another amazing shrub that grows to a height of about five to seven feet. The large puff-like blooms, together with graceful foliage, becomes an asset to the garden. The shrub bears plenty of large pink, red, crimson or white blooms. The plant is also easy to propagate. Cuttings or seeds can multiply it. The pink flowering shrub bears flowers almost throughout the year. Popularly known as gulmohri (caesalpinia pulcherima), this is also a hardy shrub suitable for growing on the berm outside. The scarlet or red, erect terminal blooms look like the peacock crown and due to this the plant has been nicknamed as the peacock flower. Gardenia, raat ki rani, etc, are also known for their fragrant blooms.